Bon Mot! - A Word Game for the iPhone and iPod touch. Getting to know Bon Mot! Bon Mot is actually three word games in one! 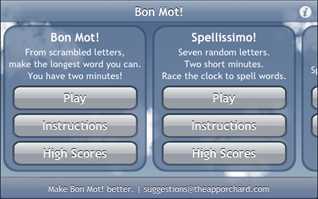 First is Bon Mot -- the signature game in which you unscramble as many 7-letter words as possible in two minutes. Next comes Spellissimo -- where you spell the most words you can from a random set of seven letters before your two minutes are up. Last but not least is Free Spell, for the times when you feel like slowing down with some leisurely word play. With Free Spell there is no time limit and your only goal is to see what words you can spell with your choice of 5, 6, 7, 8 or 9 letter tiles. Free Spell can drop random tiles using the same letter distribution as a popular board game. Or, if you prefer, Free Spell can drop scrambled words for you to unscramble as quickly or slowly as you like! Bon Mot is a two minute game. A scrambled, 7-letter word drops from above. Hovering in midair, it waits to be unscrambled. Spell words by dragging letters down to the empty sky below. Use all seven letters to earn a double word score. If you can’t decipher the full word, spell a shorter one to earn partial points and move on to the next scrambled word. Or if you’re drawing a total blank, then just double tap the sky to get a new scrambled word. Valid words are crowned with a button showing the word’s score. Tap the button to chalk up the score. When a word is scored the next one drops from above and you start over. It’s that simple! Scoring is as easy as 20, 40, 60. Blue tiles are worth 20 points. Green tiles are worth 40. Red tiles give you a whopping 60 points. And remember, using all seven letters earns a double word score! 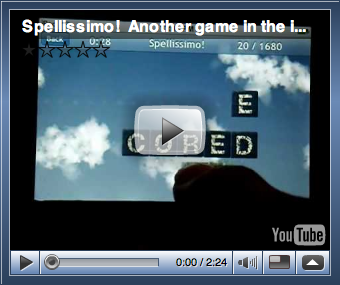 In Spellissimo, your goal is to spell as many words as you can in two minutes using the same seven letters. But Spellissimo is your friend! It lets you help decide which seven letters to use. The game starts out with a random collection of seven letters. Before the two-minute timer begins ticking, you have 5 seconds to tap away letters you don’t want. 5...4...3...2...1... Go! Spell like crazy and watch your score reach the sky! Letter values are the same as in Bon Mot. Blue tiles are worth 20 points. Green tiles are worth 40. Red tiles give you 60 points. Time to look up all those X words in the dictionary! Tired of racing the clock? Then Free Spell is the game for you. Take as long as you like to unscramble words that drop from the sky. Free Spell is not really a game -- think of it as a sandbox for wordplay. And this sandbox lets you change the settings to customize your leisurely play. By default, Free Spell drops scrambled 7-letter words just like Bon Mot. But here you can change the scrambled word size from as little as five letters to as many as nine, depending upon the level of challenge you want. Or, if your brain isn’t in the mood to unscramble words, then you can tell Free Spell to drop a completely random set of letters. 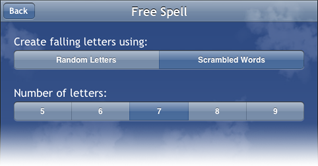 In this mode, Free Spell uses the same letter distribution as the well-known board game, Scrabble. See how many words you can spell from a fixed set of 5, 6, 7, 8, or 9 letters. Take your time, relax, and just play. Tap the round "i" button in the upper-right corner of the Bon Mot home screen to open the preferences panel. From here you can change a handful of settings that affect the entire app. Read on for a brief description of each setting. With Publish High Scores turned on, your scores are automatically sent to theapporchard.com where the all-time top scores for Spellissimo and Bon Mot are featured in the Bon Mot Hall of Fame. If you are exceedingly humble and would rather not appear in the hall of fame, then flip this switch off. Turn down the volume on Bon Mot by tapping the Quiet setting, or turn game sounds off altogether if you prefer. Quiet works well for those of us who like listening to iPod music while we play. For the full-on Bon Mot experience, Normal volume is a must! How many games have a Green Mode? Turn on Bon Mot's green mode to use less electricity and reduce your carbon footprint! 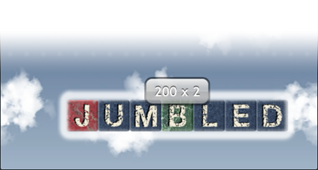 The letter tiles stop bouncing, and the clouds stand still, but otherwise everything about the game remains the same. We dig our nifty start sequence at the beginning of Bon Mot, but then again, we're the ones who created it. We figure it might get a bit old after the hundredth time. Flip this switch off to start spelling words the moment you launch your favorite word game. Game hints are those helpful little bits of text that float in the sky reminding you to do things like, Drag letters from up here... to spell words down here. We leave these guys turned on all the time because you never know when you're going to turn a new friend on to Bon Mot. But if you'd rather not see these friendly little reminders, then flip the game hints switch off. Yeah, yeah, we know. What the heck are TWL and SOWPODS? Instead of delving into the fascinating history of tournament wordplay, we'll simply refer you to the almighty Wikipedia to learn all about the TWL and SOWPODS word lists. Suffice it to say that TWL is a list of words and SOWPODS is a bigger list of words. Bon Mot can use either one of these lists to decide whether or not you've spelled an actual word.